Home Tags Posts tagged with "2nd Annual Street Hunters Meeting"
On the 18th of August I visited the city of London, UK for the 2nd Annual Street Hunters Meeting. This time round we held two official events thanks to our sponsor COSYSPEED. I had an amazing time meeting new street hunters and taking photos in one of the most amazing cities on this earth. There are so many things to do and experience in London. I think it is perfect for street shooting and if you live there you should know that you are very, very lucky! I was shooting non stop from Friday morning the 19th of August all the way until I flew home Sunday night the 21st. I covered over 60 km of walking distance during that time and I think I drunk more pints of beer than I can remember. Some of you might know I am into fitness and stuff, so all this walking gave me the perfect excuse to enjoy my favourite English Beers & Ales and Irish Stouts. I mean, I was in the UK after all. If I didn’t have plenty of beer in various pubs I would be missing out on half the fun right? This is going to be the last update before we meet for the 2nd Annual Street Hunters Meeting (#2ndASHMeeting)! This short announcement contains all the information you will be needing for that day. Don’t forget! 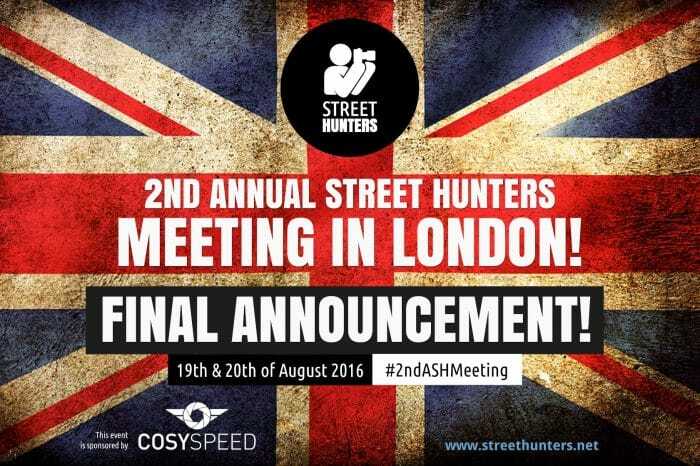 The 2nd Annual Street Hunters meeting is just around the corner! 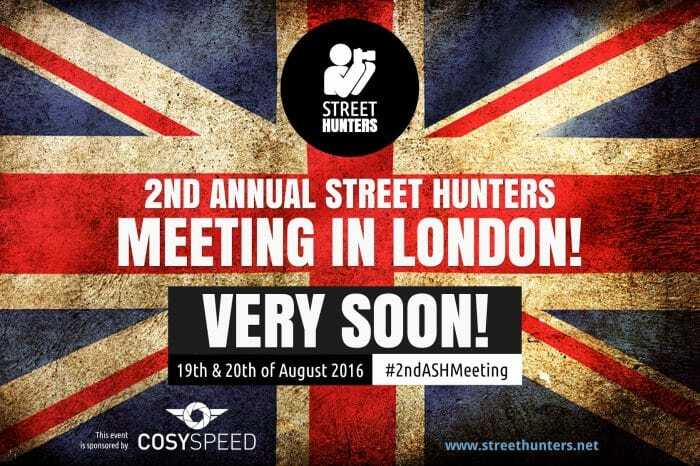 I am so excited because the time for the 2nd Annual Street Hunters Meeting is nearing and in less than 18 days I will be in beautiful London once more to meet up with you guys. This time the Annual Street Hunters Meeting is going to be sponsored by our friends at COSYSPEED and because of their generous gesture we will be spicing things up! As we mentioned in our previous post “Announcing the 2nd Annual Street Hunters meeting” besides the meeting event, we will also be conducting a FREE Street Photography workshop for beginners for 5 lucky Streethunters.net Readers! This workshop will take place on the morning of the 19th of August. All places are reserved but if you feel like sending in a request, please do so. There is a waiting list that will be activated if anybody cancels. During the workshop which will last 5 hours we will look at all the basics of Street Photography, including composition, lighting, techniques and attitude, and we will also discuss how to choose the photos you are to share/publish. The workshop will be hands on, meaning there will be no “indoor theory” time, just shooting in the streets and talking about what we love most. All participants and everyone on the waiting list will be receiving the workshop schedule/plan in the next few days so everyone knows exactly what we will be doing. It is going to be great fun! 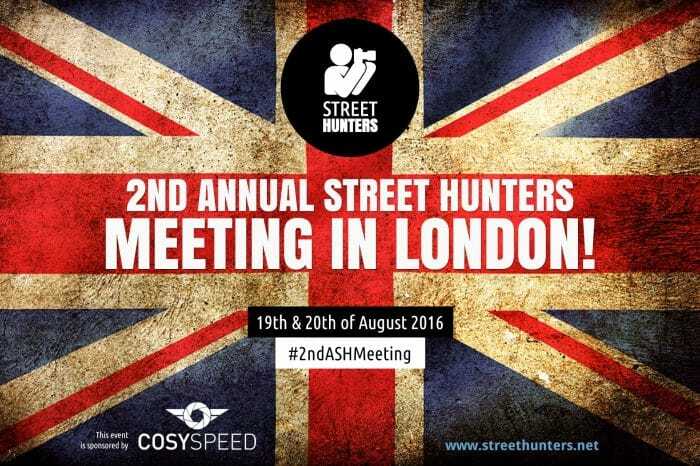 Last year we decided to hold the 1st Annual Street Hunters Meeting in London. Needless to say we had a blast, we made many new friends and we all learned a thing or two by exchanging stories, tips and tricks. It was a whole day event lasting from the morning until the evening. Personally it was one of the best days of my life as a Street Photographer! A year has passed and it is time for us to meet again. We put lots of thought into the city we should meet in, but after researching flights and access to various major European cities, logic dictated that we repeat our meetup in London. London is the European city with easiest and cheapest access on average. People from all over the world can visit since it is a hub for flights from nearly everywhere. It is massive, diverse, impressive, ever-changing and full of life. 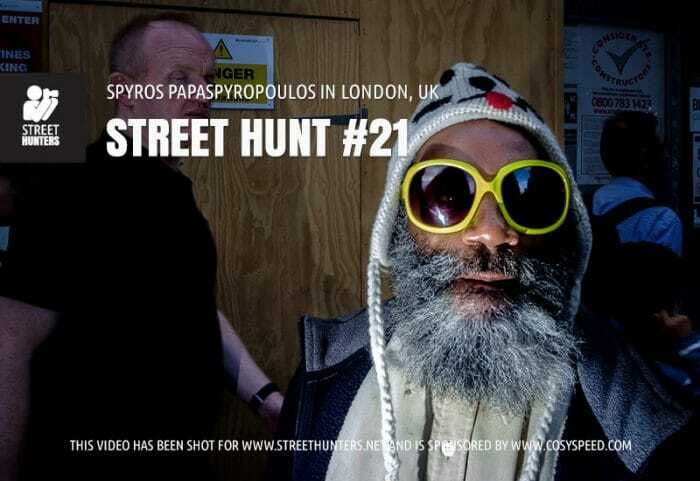 So, for the time being at least, it looks like we will be sticking to London for the Annual Street Hunters Meetings.